Samia is the Clinic4Sport founder and she started providing treatments in the changing rooms of a small tennis club in Chiswick back in 2008. From there she developed an understanding for returning tennis coaches back to play safely and decided to keep on learning and opened a Sports Injury Clinic at Dukes Meadows which is a high performance Tennis Centre in Chiswick. From there she was in contact with not only better standard of tennis but her patients had more demanding needs – this did not matter for Samia: she took the challenge head on and today she is the first Sports Therapist working at All England Lawn & Tennis Club (AELTC) in 150 years of history. On a weekly basis she has to keep ex-Wimbledon champions & Members injury free and every year she is involved with the Wimbledon Championships. In April 2010, her ‘no problem’ approach took her to travel on tour across 4 different European Countries with a marathon runner who successfully completed 50 consecutive marathons in 50 days. A passion for Sports Therapy sees Samia putting teams of therapists to provide pre and post care at major mass participation events such as: London Marathon, Tour de Force, Ride 100,The Big Ride for Africa, Oxfam Trailwalker, Tour of Cambridgeshire and Rough Runner. Samia enjoys keeping fit and healthy and believes in leading by example. Snowboarding is her primary sport and having trained for over 10 consecutive winter seasons, gives her an inside knowledge of the demands and injury possibilities within winter sports. Capable of working alone or with coaches, trainers and/or fitness advisers to implement exercise, conditioning, core stability and injury prevention programmes, so that athletes, players or participants reach and maintain peak performance. 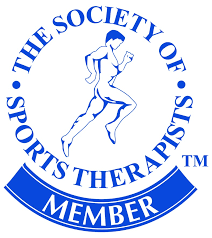 Samia is a proud member of the Society of Sports Therapists in the UK.